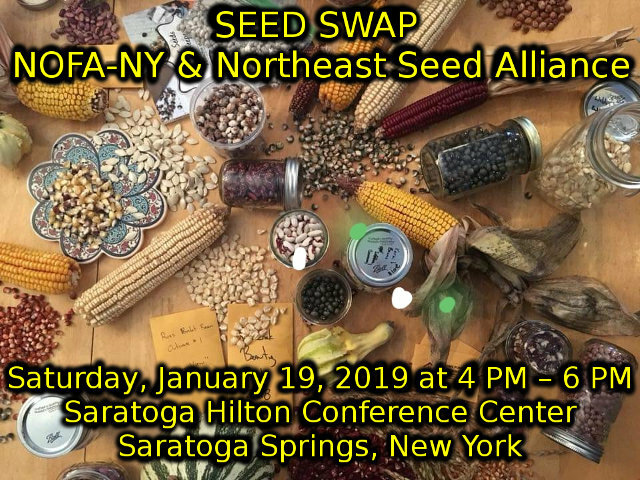 I'm expecting to attend the NOFA-NY and Northeast Seed Alliance Swap on January 19th in Saratoga Springs, New York. I'd love to meet some of you there. Seed Swap at McGuckin's Hardware in Boulder Colorado. We have Seedy Saturdays across Canada. The first one was last week, and they continue till mid-May. The small one I volunteered at last week had over 500 people attend, but the larger ones have thousands. There are seed exchanges, book trades, lectures, children's activities, information about plants, weeds, pollinators, and sales of seeds and plants (fruit trees, mushroom kits etc). I will update regularly, but I missed quite a few - we really have a lot. Already finished, in February. Blind Bay BC Creston BC Denman Island BC Fernie BC. Mayne Island BC Penticton BC Qualicum Beach BC. Robson Valley BC. Salt Spring Island BC Sooke BC Vancouver BC Victoria BC. Tofino BC Tyndall MB. Almonte ON Brantford ON Gilles ON. Hamilton ON Kitchener ON Niagara South ON Oakville ON. Picton ON Stratford ON Tehkummah ON St. Thomas ON Thunder Bay ON. Toronto-North York ON Montréal QC. Nicolet QC. St-Apollinaire QC. Sawyerville QC. Sherbrooke QC. St-Vallier QC Thetford QC. Prince Albert SK Yorkton SK Bridgewater NS. Musquodoboit Harbour NS. Truro NS Miramichi NB. The Douglas County Extension Office located at 8015 West Center Road is having their annual seed share on 26 January 2019 from 12:00 pm to 2:00 pm. You need not bring seeds to trade to get seeds in return. These seeds are not pure varieties or heirlooms. They have no accompanying romance or history. They are simply the result of several years adaptation to growing in the Ohio River Valley, with each generation selected for productivity and flavor and without chemical inputs of any kind. They are descended from largely random mixes of open pollinated varieties and will produce a varied crop. To continue adaptation to your garden and tastes simply save seed primarily from your favorite individual plants. “Landrace Gardening Blog” by Joseph Loftouse, search for it on the Mother Earth News website. “Breed Your Own Vegetables” by Dr. Carol Deppe, freelance plant breeder and owner of Fertile Valley Seeds. “Seed to Seed” by Suzann Ashworth, somewhat counter to regional adaptation gardening but a great reference of species identification and seed saving technique. *I only learned of the seed swap the day before so seeds have not been germination tested. I think that’s a good notice and information to place with you seeds at the swap. I do the same when I’m swapping seed from ‘unbagged’ seed stock. The book information is a nice touch! Great idea Reed!!! There’s another Seed Swap in Omaha, Nebraska. This year it will be at the Planetarium, not at the Botanic Gardens. Here's the disclaimer (or marketing pitch) that I post on my table at seed swaps. Yes, a marketing pitch - that would certainly attract me. I enjoyed the swap and met some nice people who were interested in local adaption and most all my seeds found homes. I left the rest for their seed library. Some seemed interested in the books I recommended too. Hopeful I may be able to maybe cultivate some new friendships and local collaborators for some of my projects. I brought home some herb seeds and a couple new to me pole beans. One fellow had some KY Butcher corn, huge flour kernels. I didn't take any cause it had unruly color genetics and didn't fit with my goal. It was cool looking corn though.